One of the oddest mysteries in Costa Rican archaeology was discovered in the Diquis Delta of Costa Rica. 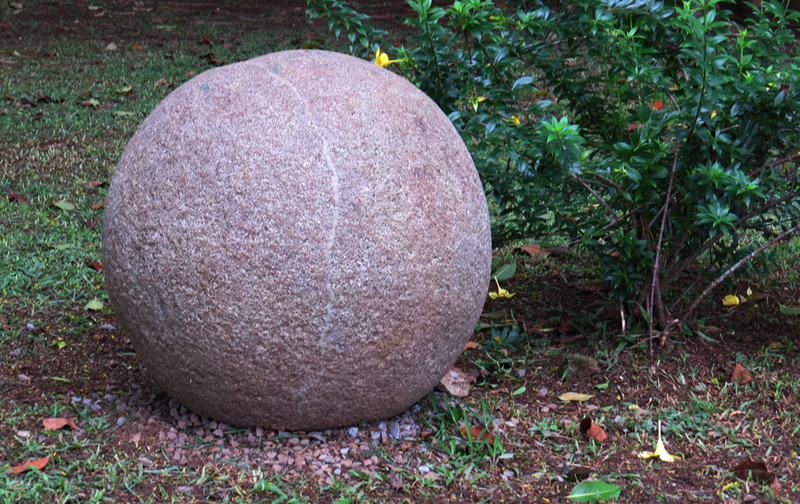 Since the 1930s, hundreds of stone balls have been documented, ranging in size from a few centimetres to over two meters in diameter. Some weigh 16 tons. Almost all of them are made of granodiorite, a hard, igneous stone that peels like an onion when exposed to temperature changes. These objects are monolithic sculptures made by human hands. There have been over 300 spheres found in the country. However there might be many more, hidden forever in the mythic forests of the South Pacific. Mostly all the spheres that have been found were moved. At frst by the banana company (Who were the first ones to find them) and later on by all sorts of people, as a theory says that they are a status mark. 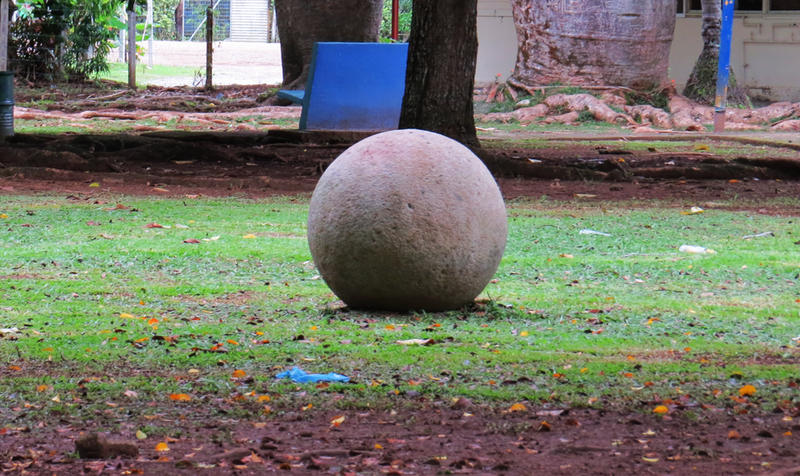 There are spheres in official buildings like Asamblea Legislativa (Costa Rican Congress), hospitals, parks and schools. And for many years on peoples gardens and corporations grounds. And of course, as well, in the museums. The raw material of the stones (graneodite) may have come from the river bed of the Grande de Terraba, and transported to the places where they were found. 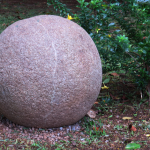 Interestingly no unfinished stones have ever been found and the final resting place of the spheres lies at least fifty miles away from the places where the stone comes from. 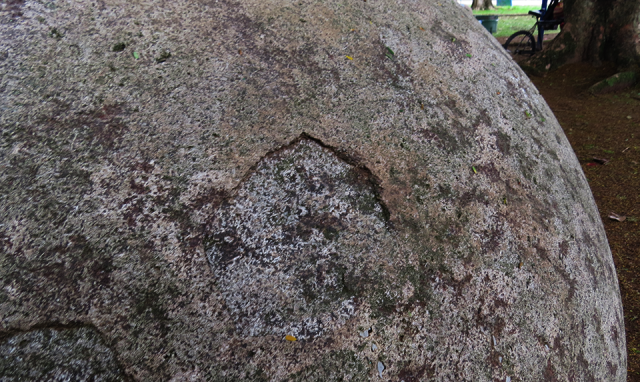 There have been all sorts of speculations around the stone spheres, from the famous Von Däniken’s “Chariots of the Gods”, to a most recent on by Ivar Zapp and George Erickson “Atlantis in America – Navigators of the Ancient World” (Adventures Unlimited Press, 1998), and “The Atlantis Blueprint: Unlocking the Ancient Mysteries of a Long-Lost Civilization”, by Colin Wilson and Rand Flem-Ath (Delacorte Press, 2001). These theories have affected negatively the state of actual knowledge about the spheres masking them in a mystical aura that has created conflict with the real archeological research. And even if some of the authors of these books have been represented as the discoverers of the spheres, the real story is that the spheres were exposed when in the 1940’s the United Fruit Company started to deforest to make their banana plantations all over the South Pacific of Costa Rica. The archeologists arrived to do research a little after and the first publication on the spheres was made in 1943. The mystery on the spheres has more to do with lost information and destruction of the original areas than with aliens or vanished civilizations. Piedras Bola in Jalisco (Ston balls), Mexico. Unlike the “piedras bola” (Stone balls) from Jalisco Mexico, these spheres are human made. And they have been endangered since their discovery, as they have been broken by tractors, dynamited by treasure hunters, and taken by people from all over Costa Rica (And the World) for their decoration or personal collections. Very few have been left in their original locations and even those are in danger due to the climate and harsh conditions of the humid rainforest. They were originally found all throughout the South Pacific area of Costa Rica. In the deltas of the Terraba and General rivers, as well as the mouth of the Coto river. Near Golfito (In La Mona and La Purruja communities) and on Isla del Caño. There are two spheres on display to the public in the U.S. One is in the museum of the National Geographic Society in Washington, D.C. The other is in a courtyard near the Peabody Museum of Archaeology and Ethnography, at Harvard University in Cambridge, Massachusetts. The spheres go from a few centimeters to over two meters in diameter. The estimated weight of the largest is over 16 tons (ca. 15,000 kg). Almost all of the balls are made of granodiorite, a hard, igneous stone that outcrops in the foothills of the nearby Talamanca range. 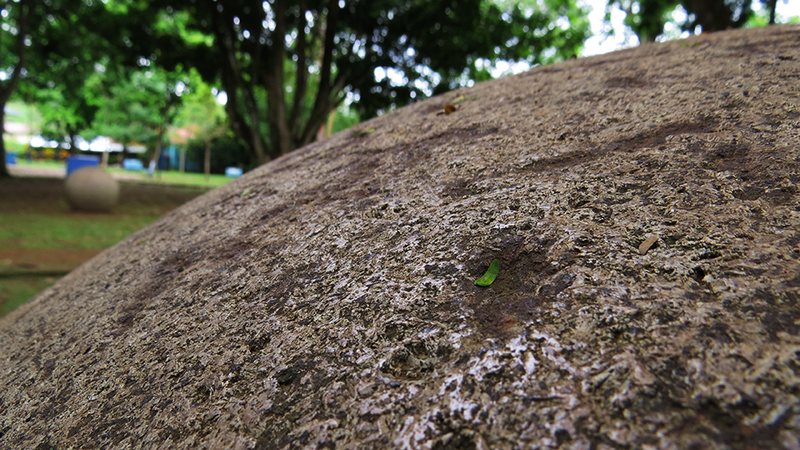 As hard as it is is a stone that peels of like an onion. 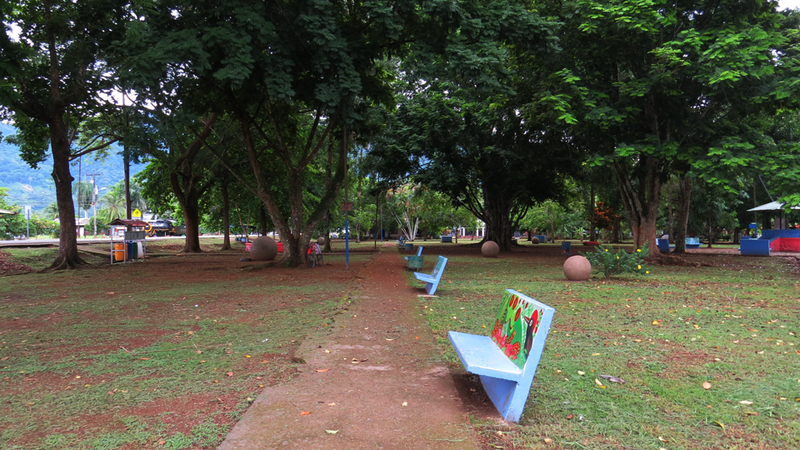 It is estimated that there are 290 spheres in the South Pacific (2010 inventory, Ifigeniaquintanilla.com), but if we account all the spheres dispersed around the country in gardens, plazas and personal collections we can go up to 500 spheres. As the graneodite has been shown to exfoliate (Peel as an onion) in layers when exposed t temperature changes, it would seem that the balls could have been fractured, pecked and grinded using the application of temperature in the process. And finally they were ground and polished. This is the same process used to make metates (Corn grinders) or stone axes. The Southern Pacific area of Costa Rica was inhabited by several dispersed groups in a mixture of the Southamerican Chibchan culture and the North Mesoamerican influenced cultures. Although, in this particular region, there was more of the South than from the North. As their diet was more based in tubers than maize, and their traditions were more directed towards the Southern tradition. Groups like the Ngobe-Buglé, the Borucas and Teribe are probably the descendants oof those who made the stones originally. Nobody knows for sure. By the time the Spanish explorers and chroniclers arrived the spheres had been already forgotten. The very few spheres that remain in their original places are in groups aligned in straight and curved lines as well as triangles and parallelograms. And this has led to a speculation of the spheres used to create routes using them as astronomical maps. But this is just speculation. Nothing is certain. At all. Nowadays, the research goes on. And it probably will keep on happening. Hard to tell, hard to know, hard to measure… These seem to be the answers together with.. Nobody really knows. What we can tell from the spheres though, is that for sure, they are beautiful and they are man made. And the factual amazment of them is created by these two combined. 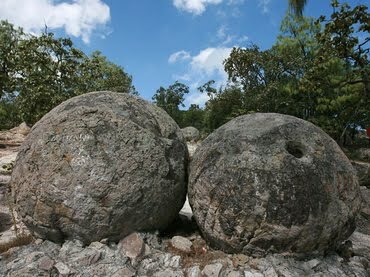 You can see them on the way to Drake Bay in the Palmar Park, that has been called the Precolombian Spheres Park.